Martin Christ Freeze Dryers is a world leader in the development and manufacturing of freeze dryers, with over 65 years of experience. Our product portfolio encompasses laboratory units, pilot systems and production systems as well as vacuum concentrators for an extremely wide range of applications and process requirements. The name Christ stands for utmost customer satisfaction everywhere in the world. We develop and manufacture our products in accordance with the most stringent quality requirements to provide superior customer benefits. Our corporate strategy is focussed on your applications. We see ourselves as a worldwide leader in innovation, and we regard our commitment to research and development as a major duty. Even more importantly, it is our greatest passion. We constantly secure our position as an international leader by means of technological innovations in freeze drying and rotational vacuum concentration – and dozens of patents held by our company and our employees provide irrefutable evidence of this. The corporate group headquartered in Osterode (Germany) consists of Martin Christ Freeze Dryers and Sigma Laboratory Centrifuges. The unique complementary nature of the individual business and research areas of the two companies leads to a constant transfer of expertise as well as uniform resource management, and ultimately to highly efficient synergy effects appreciated by our customers. Trust our competence. 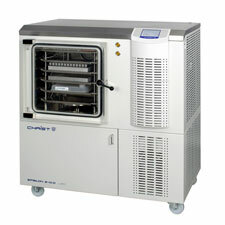 The Epsilon 2-10D LSCplus freeze dryer is a general-purpose, high-performance pilot unit featuring stainless steel shelves with internal heat transfer media channels for heating and cooling, enabling it to meet even the most stringent demands of the pharmaceutical and biotechnology industries. The key features of this unit are its drying options using up to seven shelves with a total area of 0.98 m2, adjustable shelf spacing from 38 to 170 mm, and a hydraulic stoppering device with optional stainless steel bellows seal. The Epsilon 2-10D LSCplus is equally ideal for product development and small-scale production activities.